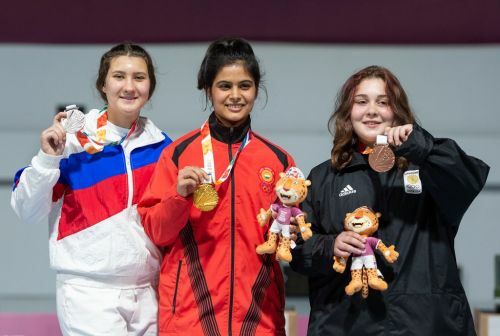 Manu Bhaker rounded off an impressive 2018 season with the Youth Olympics Gold. The medal was a welcome addition to her impressive array of collections which include two Junior World Cup Golds, a pair of Golds at the ISSF World Cup in Mexico which made her the youngest Indian to win Gold at a World cup and Gold in the 2018 Commonwealth Games. Her only downfall was at the Asian Games when she finished sixth. Bhaker stamped her authority in the Qualification finishing first with a commanding score of 576. Russia’s Iana Enina finished second with 569 followed by Kaiman Lu of China in third. A total of twenty competitors battled for the top eight spots in the qualifiers to earn a spot in the finals. In the finals, Manu Bhaker went into the lead after shooting impressively with her first five shots. The Russian closed the gap to 0.2 with the second series of five shots. Lithuania’s Greta Rankelyte took the eighth spot after becoming the first person to be eliminated. She never found her rhythm in the finals registering her best effort of ten points with her last shot. Bhaker’s pair of 9.8 found the Russian breathing down her neck by a margin of 0.1. 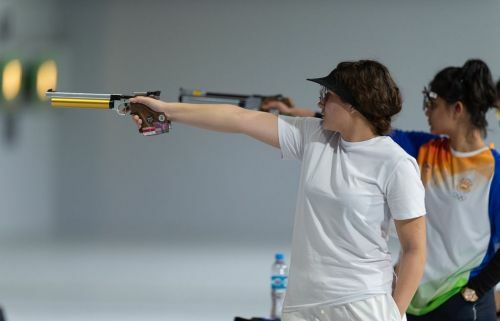 Fatimah Abbas Al-Kaabi of Iraq shot erratically to take the seventh position. A nervous 7.7 effort with her last shot ended her medal hopes in the competition. Meanwhile, Russia’s Iana Enina had a couple of eight-point scores to be displaced to the fourth position. The Indian now enjoyed a healthy 1.5 point lead over her nearest Thai rival Kanyakorn. Kaiman Lu of China finished sixth after a disappointing final. Manu again had a pair of 9.3 which left the Thai girl trailing in second place by 0.3 points with eight shots remaining. Finishing in fifth was Anja Prezelj of Slovenia as her final shot of 8.7 saved the Russian from elimination. Both the Indian and the Thai shooters came up with identical scores to remain in first and second positions. Thailand’s Kanyakorn Hirunphoem blew her medal chances after her efforts of 9.3 and 8.0 eliminated her to a fourth-place finish. 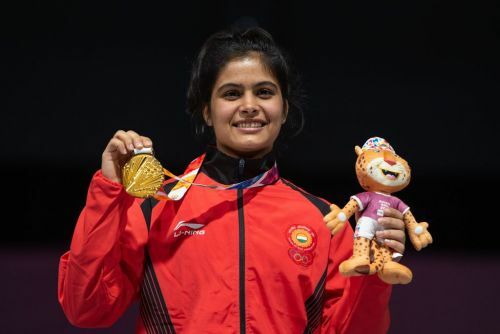 For the first time, Manu Bhaker lost the lead after a poor 9.1 effort in her nineteenth shot. Nino Khutsiberidze of Georgia went 0.1 ahead of the Indian to lead the field. In the Bronze medal deciding series, the leader Nino Khutsiberidze of Georgia had a nervous 8.3 followed by a 9.8. The Georgian drifted 0.1 points behind the lucky Russian to end up with Bronze. In the decider for the Gold medal, Bhaker had a healthy 1.5 points lead over the Russian. Iana Enina came up with an impressive 10.7 to mount pressure on the Indian. Manu came up with a solid 10.1 to maintain a lead of 0.9. Manu needing a score of 10.1 or above shot 10.2 to secure the Gold. The Russian came up with a brave effort of 10.5 to secure the Silver.